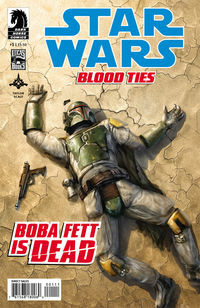 Leading the hit parade this week is STAR WARS BLOOD TIES BOBA FETT IS DEAD #1 (OF 4). YEEAAAh illustrated or should we say PAINTED by Chris Scalf. While a new Blood Ties begins – Crimson Empire III ends with issue # 6 of 6 out this week. It has been a good ride but it’s time for Kir to go now. 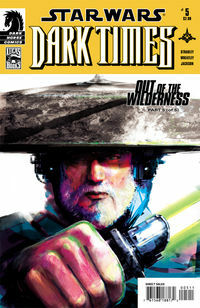 OOOH but wait Dark Horse has one more awesome ending for us this week with Star Wars: Dark Times-Out of the Wilderness #5 – illustrated by the one and only Douglas Wheatley. Dark Times is an awesome series that has been plagued by publishing delays since the beginning – let’s hope that this final issue is everything we’ve been waiting for! Zayne Carrick is the hero that we kinda/sorta love to hate. After all he has no blood lust, he just wants to live his life, he’s not interested in being the hero. Yet in this issue when force the Mandos to return to the planet from which the Republic drafted him, he helps them take control of a station — in an effort to save lives. Then he comes back to help save his Republic friends. But no, we still see no signs of his girlfriend, but for the first time in this series we do see his old ‘boss’ Gryph. We had some doubts about this series when it first started, but Dark Horse and the GREAT John Ostrander have proven us wrong. From first page to last, this issue gripped us with action that we couldn’t put down. Jahan Cross beds his enemies sister, then she gets toasted not by her brother as we expect, instead the brother is killed by the robotkilling father. Now how are they going to get off the iron eclipse? Sure Han and Chewie will just swoop in ….. In any event, the addition of Jahan Cross to the Star Wars canon is a great one, he’s a character that we want to see a whole lot more of from Dark Horse in the months and years to come. A great week ahead for SciFi comic book fans. 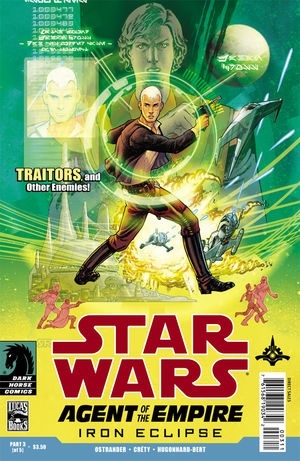 At the top of our list is Dark Horse Star Wars Agent of the Empire #4. This series first story arc is coming to a close and we really have no idea quite how this will be resolved. So far it has been a fun ride though. this new issue looks to continue that trend. We get a double dose of Star Wars goodness this week too with the release of STAR WARS KNIGHTS OF THE OLD REPUBLIC WAR #3 (OF 5). 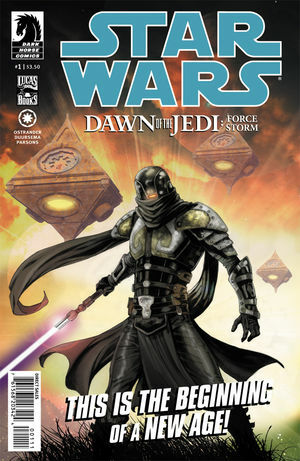 Forget about Jedi – the new Star Wars Dawn of the Jedi Series is about the JE’DAII. These JE’DAII are the predecessors of the Jedi we all know…they’re also a bunch of wimps that have been sequestered in black hole surrounded planet Tython to protect them. Yeaah we’re talking about the new Dark Horse comic book here – it’s an amazing concept, but unlike Legacy which from the first page was PURE AWESOME. This title might take a bit more time till it grows on us. What Dark Horse is doing here is giving us the ultimate prequel – but it’s a bit too far fetched in some respects..so far. These early jedi were all about finding balance between the light and the darkness. Though at this early stage the darkness are not the Sith. The evil forces are led by Force Hounds like Xesh – that’s the dude on the cover of issue #1. He’s working for the Rakatan and their empire. Apparently and this shocked us.. the Rakatan are the dudes that turn Tatooine from a lush paradise into a dessert too.. This series is also really picking up nicely…though this particular issue was all about one thing..
JAHAN CROSS ON THE RUN. Nothing more really, the agent of the empire is running from the corporate sector police (into Han Solo’s smuggling containers too!) but no new major revelations about the plot. 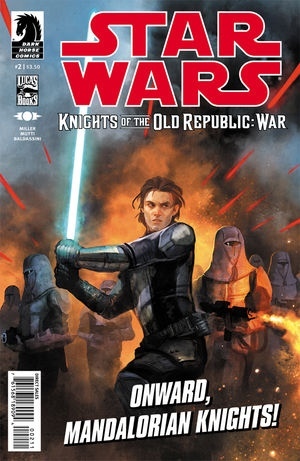 The first issue of KOTOR War was ok…but this second issue really picks up the pace. We learn about the new Mandalorian Jedi..which is a neat idea and one that we hadn’t seen before It’s also neat that they drafted Zayne and the commander of his ship too…though that didn’t quite work out. This is an engaging story..we’re not quite sure what happens on the next page and that’s how we like it. This is a story that keeps us guessing and amazed by it unfolds. We should see Zayne finding a way to leave the Mandalorian army sooner rather than later..but it’ll be interesting to see how much damage he does first. Wow what a great week for SciFi comic fans! We’ve got at least four really great titles out this week from Dark Horse alone to look forward too. 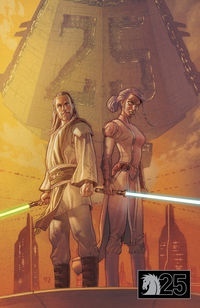 At the top of our list is Star Wars Knights of the Old Republic: War #2 – sure we weren’t thrilled with the first issue, but hey we’re sure thrilled to have KOTOR back! Next up is STAR WARS CRIMSON EMPIRE III EMPIRE LOST #4 (OF 6). This is a series that we waited years for and each issue is better than the next. STAR WARS AGENT OF The EMPIRE IRON ECLIPSE #3 (OF 5) – we loved the last issue and can hardly wait to crack this one open. Dark Horse also has DARK MATTER #2 (OF 4) – which is written by the team behind Stargate (the show!) and hey it’s kinda neat too. And next week – Dawn of the Jedi #1 is out!! can this month get any better? 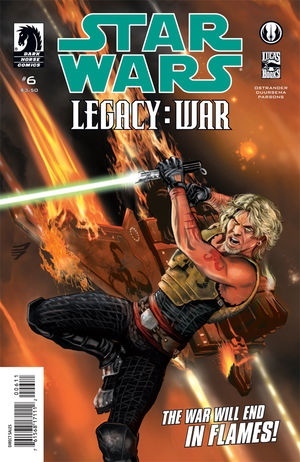 Ever since John Ostrander revealed he would be working on a new series – after the greatest Dark Horse Star Wars comic of all time — Legacy — we’ve been excited about his new project. After reading it – we’re interested, but a bit underwhelmed. Agent of the Empire is essentially a James Bond kind of character working for the Empire. Ok that’s alright, but he’s a stick figure of a character (so far) without much personality. That artwork is passable and not up to Legacy standards yet either. And from a canon perspective – when did we find out that Han Solo went to the Imperial Academy? somehow i missed that before…a neat twist though and seeing a younger Han Solo makes this book almost worthwhile. So long story short, empire’s agent is hunting down bad apples in the Empire…..
Sure we’ll keep reading this – it’s only a five issue series after all – but the premise isn’t nearly as strong as the previous generation of Star Wars titles and so far, neither is the plot, artwork or characters. 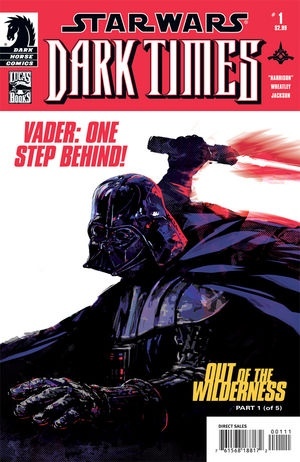 Dark Times was one of our fav Star Wars comics when it first appeared on the shelves a few years back…. That said when all the issues did come out, especially for the last Blue Harvest series, they were awesome. The art of Wheatley is second to none. And of course the art is just brilliant too. But wait..it’s not all of ’em. AND FRAK YOU DARK HORSE it’s not even the current ones coming out this week. Dark Horse is making old books (including the original Marvel Series) some new stuff, including some Knights of the Old Republic, Old Republic and Star Wars Legacy War – available. It’s a mixed bad and not complete. Let’s hope that Dark Horse build a complete back catalogue and more importantly begins to ship digital titles the same day as the paper ones. And oh yeah the prices is better. From our brief look, most titles are $1.99 instead of the $2.99 or $3.50 that most Dark Horse print Star Wars titles have been lately. So yeaah this could (eventually) be a really good deal and the final nail in the coffin for our local comic book store. Why pay more when we can get it all on the iPad instantly for less? First up is Jedi the Dark Side… Now the art isn’t what we typically like..but after reading the first two issues it has started to grow on us. Qui Gon is the central character but he’s not the jedi of episode one and he sure likes to yell at his padawan..Xanatos. The Jedi librarian character Tahl is really interesting too as she comes off As the wise jedi master..
Where will this series go? What will happen to Xanatos? We know Qui Gon gets Obi Wan as a padawan at some point and a master only gets one padawan..
What an amazing finale to an amazing series. The galaxy is ruled by a triumvirate of empire, alliance and jedi..
Oh and Cade? Back to being a pirate…. This is an ending that solves most of the loose ends..and is a real ending…..
Sure the sith will come back one day…but for now everything has been settled. From begining to the end Legacy has been the best Star Wars comic of all time and one of the best stories in the entire cannon. Briiliant storytelling, matched with glorious artwork combined to deliver an experience that we will dearly miss. of the greatest SciFi comic book series of all time. 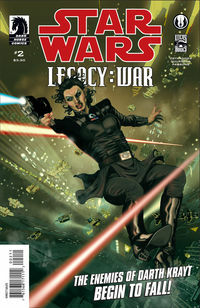 After 56 issues (50 regular and 6 Legacy War), Star Wars Legacy is coming to a close with Star Wars Legacy: War #6. We don’t think that Dark Horse will be extending beyond this (but hey those FRAKKING DOUCHE BAGS have done this to us before). Legacy coming to an end…will Cade survive? Will Darth Krayt? Cade’s mom has gotta be toast? Will Roan Fel emerge as the new emperor? Will the galaxy be united? There are so many questions and so many sub-plots in play, we don’t know HOW Dark Horse can wrap this up in one issue. 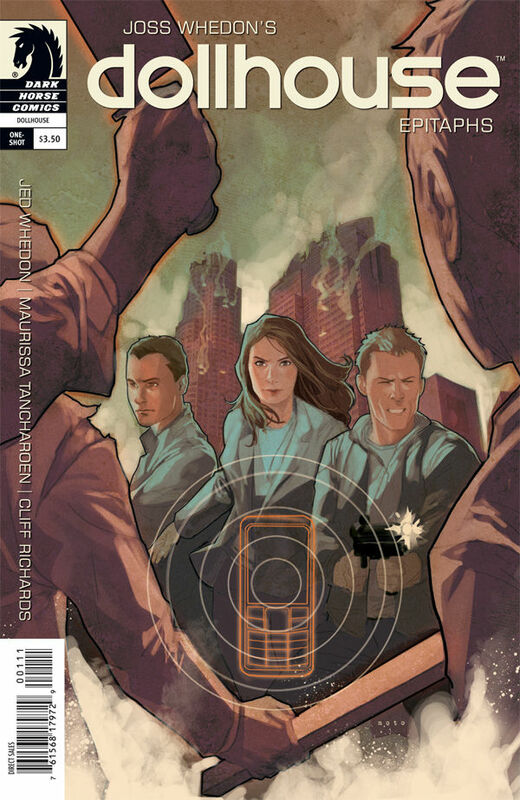 In any event, Legacy writers and artists, John Ostrander in particular has never disappointed us and we can hardly wait to pick this book up. We finally got our hands a copy of John Jackson Miller’s Knight Errant novel. We loved the comic book so we had some pretty high expectations. How do you translate a comic to a book? As it turns out, it translates exceptionally well. This is a story that has more story arcs than 20 issues of Dark Horse comics would have provided. Kerra doesn’t just deal with Damian and Odion but a whole host of Sith baddies..and even uncovers the truth about who controls Sith space. With twists and turns all over the place, this is one of the best Star Wars books we’ve read in years. Solidly entertaining and engaging on every level. epitaph one was where the dollhouse show ended. The comic starts at the same spot ..but unlike the show this is really quite lame. In a one shot we expect a self contained story, but that’s not what we get. This is just a drawn out prologue for a new dollhouse comic book series. We don’t have a problem with that, but hey the one shot should have been btw. One of our favorite Star Wars authors of all time, John Ostrander is set to pen the next big Star Wars series from Dark Horse. Sounds good to us. 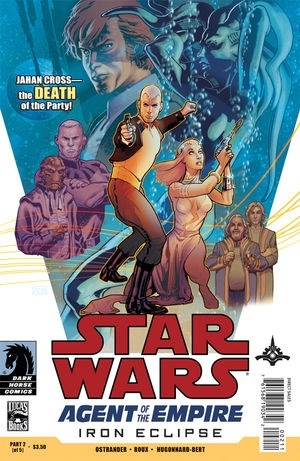 We have seen some limited detective type novels in the Star Wars universe, but never in the comics..
Wow…where do we begin to review a comic as fantastic as Dark Horse’s Star Wars Legacy War #3? Andwhat was up with Darth Talon showing up with a carbonite slab? COME ON? Don’t tell me that Cade couldn’t smell a trap..that just seems odd…then again..it’s a trap within a trap within a trap isn’t it? For the first time ever we have the Galactic Alliance, Roan Fel’s Empire, Krayt’s Empire and the Jedi in one place.WOW. wE CAN hardly wait till next month to see the action unfold. Met Admiral Gar Stazi before. That’s shocking. But it’s great that they finally have – and oh yeah Darth Krayt should be shaking in his big Sith boots. Cade is Sith Killing Machine and he’s unstoppable now. Speaking of Roan Fel – aside from running away from Sith — what’s up with him? He’s the weak link of the bunch. Not the ultra-dude that Cade is, not the General like Gar Stazi and not the maniac that Krayt is now becomming either. All in all, this issue continues to remind us why Star Wars Legacy is the best comic book title ever produced by Dark Horse. 1980 Vintage Star Wars Yoda Belt Original No Repo!